Komen Atlanta’s Worship in Pink program invites Atlanta’s faith-based organizations to come together to spread the lifesaving message of breast cancer early detection. WIP is a program designed to open the lines of communication about breast health, promote breast cancer education, and celebrate the lives of those who have fought against breast cancer. Thank you to our Local Ford Dealers for helping make Worship in Pink possible! Participating in Worship in Pink is easy. Komen Atlanta provides each organization with a planning toolkit, as well as FREE calendars with updated breast health information. Each congregation is encouraged to use the Worship in Pink program to celebrate breast cancer survivors and co-survivors in their community during the month of October. For example, your organization could host a special luncheon for survivors, encourage the congregation to wear pink or invite survivors to speak about their experiences with the disease. *If registering after September 24, you must pick up your calendars at the Komen Atlanta office in Buckhead starting October 2. Are you coordinating Worship in Pink for your organization? Read our WIP Toolkit to get started with programming suggestions, sample scripts and other information! 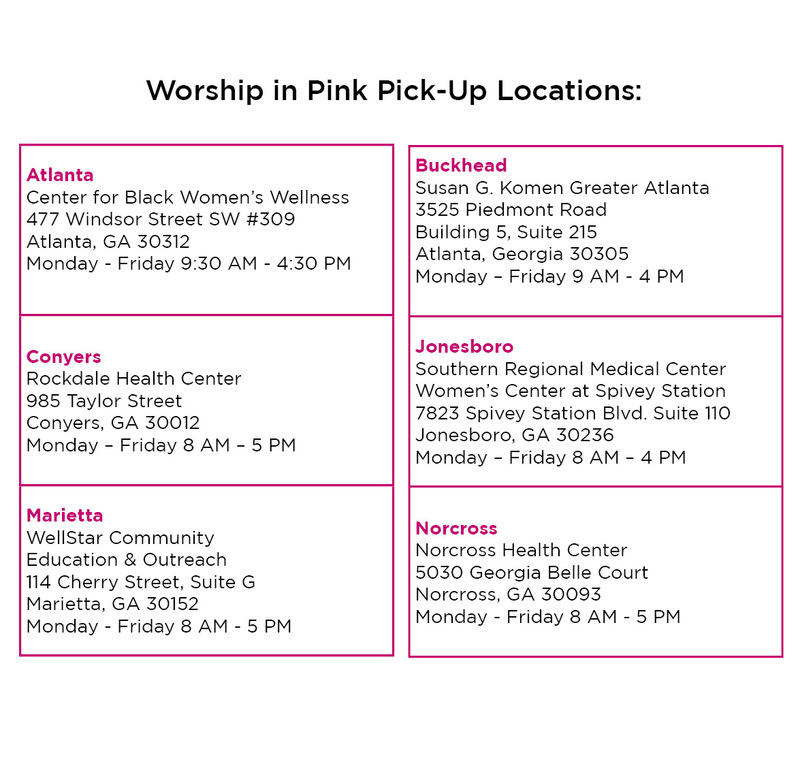 Komen Atlanta provides the following free downloadable materials to enhance your Worship in Pink Program. Please feel free to download them and make copies as you wish. Spanish language materials are available upon request. Fore more information on low-cost screening and diagnostics services, treatment and support available to you, click here. If you would like to learn more or have any questions, please contact Tamara Nash at (404) 814-0052 or tnash@komenatlanta.org. We hope that you will participate in Worship in Pink and help us create a world without breast cancer!